Well I can speak to that, since I was there, and I was one of the 10 taken into custody. There was nothing confusing about the orders given by PPB over their loudspeakers to the crowd. Once we were surrounded, everyone who was standing lawfully on the sidewalk was ordered into the street. Figuring this was a trap, most refused. At the time we were surrounded, I was on the sidewalk where I’d been for most of the 4+ hour long march, shooting still photographs throughout. When ordered into the street, I took a step off the curb and stayed there, but didn’t approach the middle of the intersection as ordered. Nobody did, out of fear of being singled out. With so many crowded into the corners of the intersection, police began grabbing whomever they could get their hands on, myself included. I did not resist, nor made any protest of my arrest. I answered only required questions about my name, address, and whether I was carrying any weapons (I was not). Once stripped of my belongings, handcuffed, and loaded into a police van with five other men, it was then we realized three of us were there as citizen journalists documenting the protest, not actively participating in it. While the CRC was right to condemn the kettling, mass arrests, and unfounded charges, they made no mention of the violence inflicted on the very same crowd just an hour earlier. Blocks from the ketting site, the energized crowd had shown no signs of tiring, but chose to stop at a 4-way light rail crossing near Pioneer Square. This effectively shut down the heart of the city’s mass transit system. 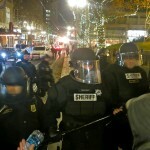 PPB gave several orders to disperse, which were largely ignored. As detailed in a piece I wrote at the time, a phalanx line held between police and protesters didn’t move for several minutes. Seemingly at a stalemate, the cops reluctantly commenced a retreat. The march began advancing forward, against the orders of police via loud speaker – which was barely audible over the chanting of the crowd. Suddenly without warning, a PPB officer threw three concussion grenades into the crowd, each exploding in rapid succession. Not ten seconds after detonation, again without warning, the wall of riot cops rushed the stunned crowd swinging batons, striking both protesters and onlookers, knocking them to the ground. I took cover in a hotel doorway, yet was struck in the back 7 or 8 times in a row by at least 3 different officers who then body-checked me out of the doorway and into the street. An alternate angle below captures the minutes leading up to the confrontation. Skip ahead to the 12:00 minute mark for the attack. PLEASE READ DESCRIPTION FIRST!!!! In the beginning of my video, I documented an argument between a couple bystanders and protesters. That went on for several minutes. But later in the video Portland Police used Flash Bangs on us, skip to like 9:00 minutes into the video if you want to see and then wait for awhile. Despite the brutal nature of the attack, most seemed unharmed. I wasn’t injured in that moment. But after the arrest an hour later, after 4 hours spent in handcuffs, after a brief but insightful interrogation, and then after another 6 hours in jail out of handcuffs, I was exhausted and hungry. Upon release, my keys, wallet, and phone were not returned to me. I was told they were being held as evidence, and that I wouldn’t be able to pick them up for several days, as this was still the weekend. I couldn’t go home, I couldn’t buy food, I couldn’t even call for help. It felt as though I’d been dumped on the side of the road after a botched kidnapping. The disorderly conduct charges against the 10 of us were dropped three days later at arraignment. All of these details were included in my own complaint filed along with the 40 others that predicated the CRC’s review. To date I’ve only received form letters from the auditor’s office indicating the investigation was ongoing, but nothing that addressed specifics of my own filing. There had been talk of a class action lawsuit over police misconduct that night, but so far it seems nothing of the sort has materialized.